The LM324 operational amplifier IC can be worked as a comparator. This IC has 4 independent operational amplifiers on a single chip. This a Low Power Quad Operational Amplifier and it has high stability, bandwidth which was designed to operate from a single power supply over a wide range of voltages. The quad amplifier can operate at supply voltages as low as 3.0 V or as high as 3.2 V with quiescent currents about one fifth of those associated with the MC174. The common mode input range includes the negative supply, thereby eliminating the necessity for external biasing components in many applications. The output voltage range also includes the negative power supply voltage. please follow the link to know more about different types of comparators and their applications. Different types of comparators and their applications. 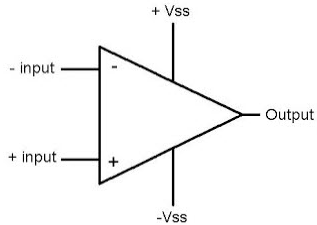 The comparator is a circuit and it is used to compare the two output voltages of V1 & V2. If the voltage V1 > V2 then the output voltage is zero. If the V2 > V1 then the output voltage is a positive terminal. The symbol of the comparator is shown below. The LM324 comparator circuit consists of sensor voltage, reference voltage, Vcc, ground and output pins. The following circuit shows the LM324 IC circuit and here we are explaining about the each pin of LM324 comparator. The following diagram shows the pin configuration of the LM324 comparator circuit. It consists of 14 pins and the function of each pin is described below. The following circuit shows the Voltage comparator, the components required for this circuit is the LM324 comparator and the two resistors with a value of 10K ohms. The two inputs like input A and input B are from the output of the line sensor circuit and the two resistors are used to set the voltage reference to produce the best digital output. From the above circuit, we can observe that Node A & Node B, they are connected to the non-inverting input of left and right comparators. The output of the left comparator is connected to P1.0 of the Microcontroller and output of the right comparator is connected to P1.1 of the Microcontroller. Both the comparators are wired in non-inverting mode. The working of the LM324 comparator circuit consists of three comparators of LM324 and some other components like resistors, capacitors, and ground. 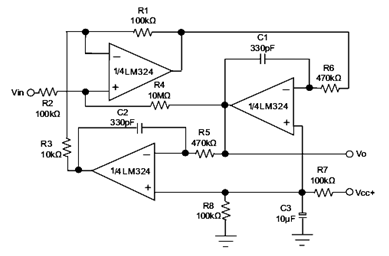 The working of this comparator is explained by using the following circuit by simple steps. When the power is applied to the non-inverting terminal which is less than the inverting voltage of the op-amp then the output becomes zero which means there is no current flow. Because we already know that when “+ > – = 1”. Here the ‘+ ‘sign indicates non-inverting terminal and ‘-‘ sign indicates the inverting terminal. It is internally pulled-up, so no need of any resistor connection of the power supply. The LM324 is applicable for the oscillators, amplifiers, rectifiers, comparators etc. 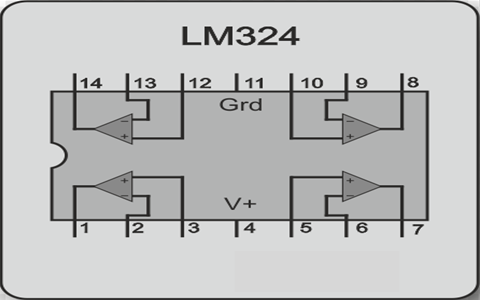 In this article we have discussed the LM324 comparator circuits, working and its applications. I hope by reading this article you have gained some basic information on LM324 comparator. If you have any queries about this article or about the implementation of the Electronics & Electrical projects please don’t hesitate to comment in the below section. 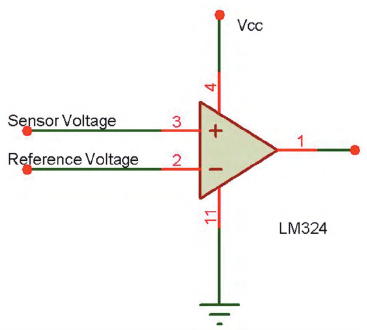 Here is the question for you, what is the difference between LM324 and LM339? Sorry to inform you that once you purchase the project only we will provide you the circuit diagram and all the required documents.